Shot in June, 2015, at Whistling Gardens. RATING: ♥ ♥ ♥ (This highly unscientific and thoroughly opinionated rating system is based on a range from lowest score of one ♥ to a highest score of 5 ♥♥♥♥♥. THE TIP-OFF: At not one but several different seminars I attended earlier this year at the Toronto Botanical Gardens, the names of good nurseries for trees and shrubs in Southern Ontario were traded with such tense excitement that the details could have been connections for crack. But only one name was evoked with reverence over and over again: Whistling Gardens. Another adventure was afoot. FIRST IMPRESSION: The Whistling Gardens website builds a very good case for making the drive from just about anywhere in Southern Ontario. There’s a variety of gardens to explore and much more, including an aviary and an amphitheatre with over one hundred fountains choreographed to music composed by the gardens’ owner, no less. You’d think you were in for a sensory extravaganza. But I made the mistake, in hindsight, of checking out the “Temple Garden” and “Fountain Amphitheatre” before getting to the reason I’d sought the place out to begin with–the Conifer Garden. I wasn’t sure what to expect but rows of impatiens are not my idea of a botanical garden. In the Temple Garden, this and other statues ring a small metal gazebo. A wall flanking the fountain amphitheatre. Part of the Garden Arbor at Whistling Gardens, shot in June, 2015. On the other hand, once I finally found the Rock and Conifer gardens, I thought “Okay, now I understand what all the fuss is about.” The number and variety of evergreens is truly impressive and each is planted to take full advantage of its size, shape, colour and texture. These two gardens will give you plenty of ideas on how to site trees and what other plants to pair with them. In the Conifer Gardens, you’ll get plenty of great gardening ideas, like using rocks of various sizes to add interest and do double duty as mulch. Trees and shrubs in the Conifer Gardens are sited to show off their various sizes, textures, shapes and colours. It’s easier to understand how a tree or shrub can add interest to a garden when you see it in a garden setting like this eye-catching Picea abies Repens. The Rock Garden has sweeping paths that lead you towards the Conifer Garden with plenty to see along the way. Be sure to seek out the row of weeping conifers, placed to look like a line of slumping giants marching off into the distance. And if you’re a fan of weepers, take a good look at The “Welcome Garden”, shown below. It’s cleverly ringed with waist-height weeping conifers that have been trained to create a living fence. Weeping conifers form a living fence around the Welcome Garden. A close-up of the Welcome Gardens’ clever living fence. WHAT’S OFFERED: There are over a thousand conifers on display in the gardens with some extremely rare specimens. The Rock Garden also has a variety of dwarf conifers along with alpine plants, succulents and plenty of flowers. In spring, blooming Muscari form a blue ‘river’. The Garden Centre 2015 Catalogue listing of rare and unique trees is looooooong. There are more choices here than you can ever imagine. My advice is to do a little research about what kind of tree you’re interested in before you come out to visit. 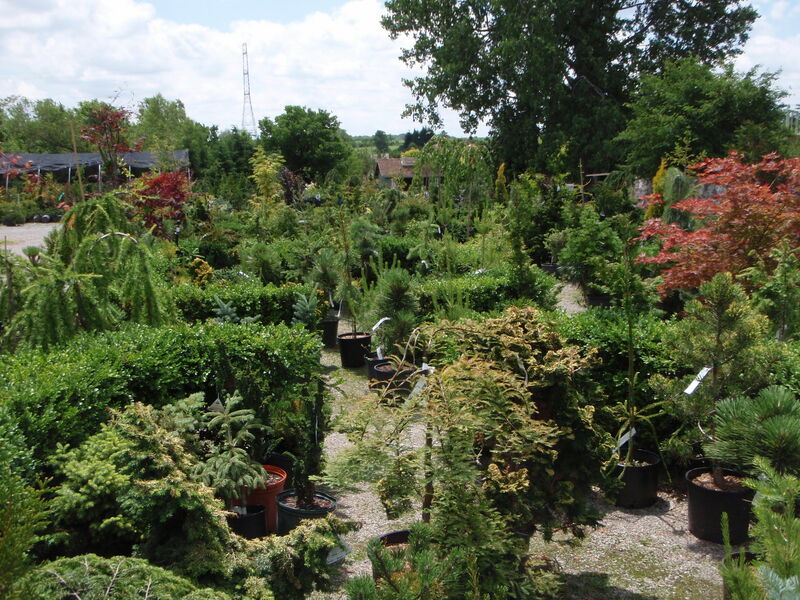 The Whistling Gardens garden centre is stuffed full of an astounding assortment of specimen and hard-to-find trees and shrubs. CUSTOMER SERVICE: When I visited the gardens on a very warm June afternoon, there was a refreshments stand but no one attending it. The one woman working at the garden centre couldn’t tell me if they had any prostrate junipers and when it was established that they did have some, she didn’t know where they were. I asked about the fountain show posted to start in a couple of minutes. The woman replied that “he” was having his lunch so the show might not start on time. At that point, hot and tired after wandering through all the gardens and faced with waiting for a scheduled show that was unlikely to be on schedule, I wasn’t feeling the love. WORTH THE DRIVE? Located southwest of Hamilton, Whistling Gardens is close to many major urban areas in Southern Ontario as well as from neighbouring northwestern New York. If you’re driving from Toronto, you could easily work in a visit to the Royal Botanical Gardens on the same day. 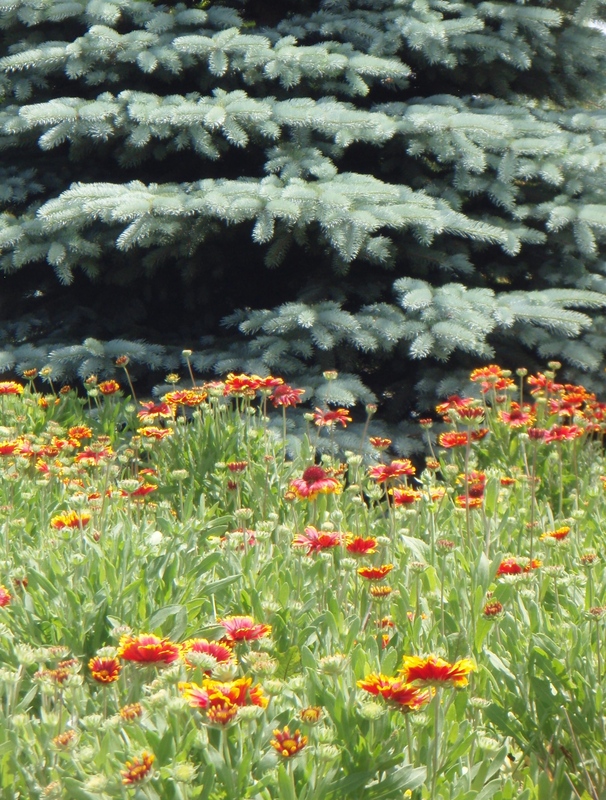 If you’re interested in a special tree or shrub, particularly conifers, and want to see what the mature plant might look like in a garden setting, then, yes, it is worth the drive just to stroll through the exceptional Rock and Conifer gardens. WOULD I GO BACK? Only if I was in need of a fine specimen tree as a showpiece. For that, I know I’d get what I came for.